Dhaka, 2 June, Abnews: Prime Minister Sheikh Hasina offered ziarat at the mazar of Father of the Nation Bangabandhu Sheikh Mujibur Rahman here this morning. Accompanied by Sheikh Rehana, the younger daughter of Bangabandhu, the premier offered Fateha and joined a munajat (prayer) seeking eternal peace of departed souls of the Father of the Nation, Bangamata Begum Fazilatunnesa Mujib and other martyrs of the August 15, 1975 massacre. Prayers were also offered seeking divine blessings for good health and long life of Sheikh Hasina and Sheikh Rehana and their family members as well as continued peace, progress and prosperity of the nation. 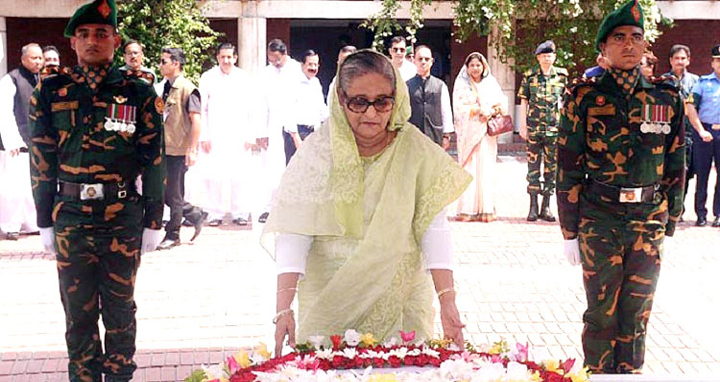 Earlier, the prime minister paid rich tributes to Bangabandhu by placing a wreath at his mazar. After laying the wreath, the prime minister stood in solemn silence for some time as a mark of profound respect to the memory of the architect of the independence, who was brutally killed by some disgruntled army men on the dreadful night of August 15, 1975 along with most of his family members. Secretaries concerned to the prime minister and local Awami League leaders were also present on the occasion. Later, the prime minister held a meeting with officials of the district administration and local Awami League leaders. Sheikh Hasina also handed over Eid gifts among the children and officials of Sheikh Russel Distressed Children Training and Rehabilitation Center as well as officials and employees of Sheikh Jamal Youth Training Centre at Bangabandhu’s Mausoleum Complex.